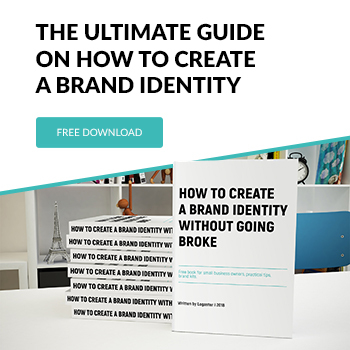 What is a logo and why do you need one? Designing a worthy logo is one of the key tasks every novice businessperson must complete. A logo is a corporate image that performs emotional and informative functions. It brings out the feelings and values you share with your audience. It also characterizes your company and emphasizes its strengths, making it attractive in the eyes of potential customers. A business can use a logo in a number of ways, such as to promote its products, establish its brand identity, or attract new clients. Launching your business can be difficult in terms of finances. Entrepreneurs (especially those who have been careless with money) start to understand the value of money and count every penny. In this sense, owning a business makes a person more disciplined. Plus, novice businesspeople aren’t good with time management and often get lost in a series of missed deadlines. If you’ve recognized yourself in these lines, you probably shouldn’t spend too much time creating an emblem. You’d be surprised to learn that hiring a designer isn’t the only way to get the logo of your dreams. 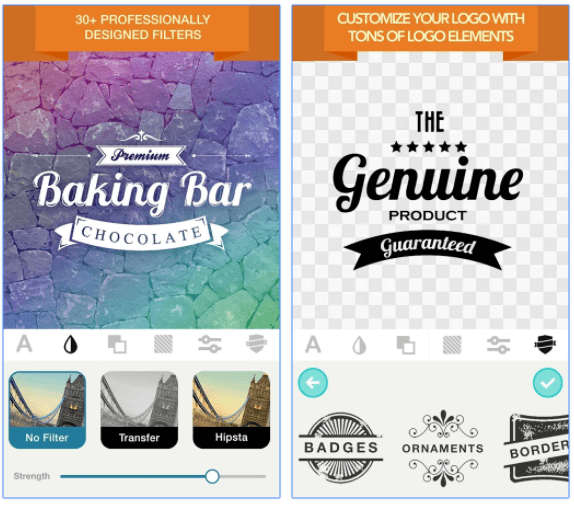 If you’re an Android user, you can find a bunch of logo creation apps on PlayMarket. Android is a major mobile operating system that offers plenty of apps for smartphone and tablet users. We’re sure the right app for you is out there! You just have to look for it! 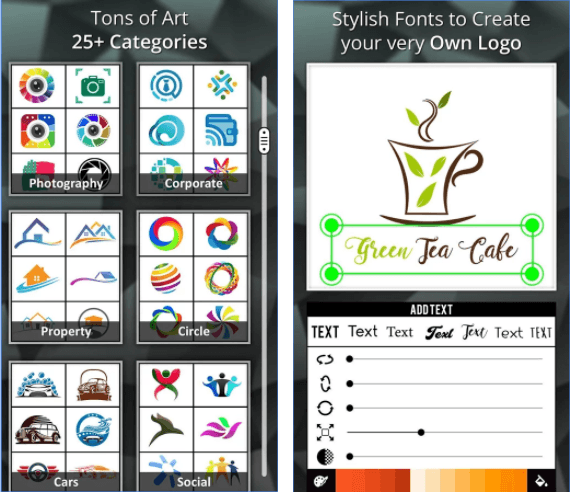 What are the advantages of designing a logo in an Android app? 2. It’s affordable (if the app is fee-based) or even free. 3. You don’t need drawing skills or have to spend time looking for a seasoned designer. 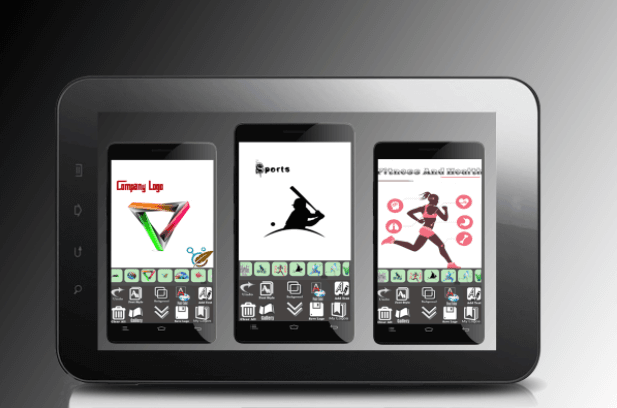 Give it a try and make your logo ideas real on the screen of your Android smartphone! Here’s another challenge. What apps can you rely on? Whether you’re choosing between two or twenty programs, each has its own unique features and benefits. To decide which one is best for you, you must test each app. 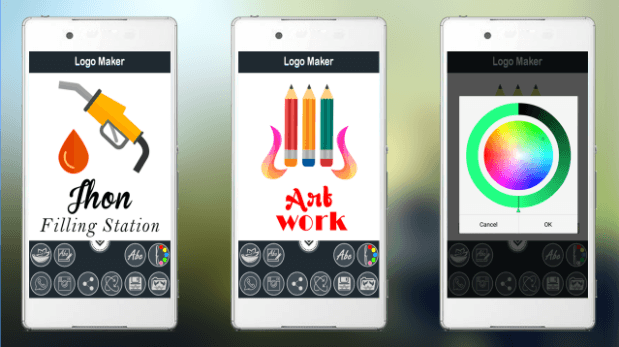 We’ve created a list of amazing Android logo maker apps that have impressed us with their functionality. Enjoy! Logo Maker Plus is a pro at creating unconventional emblems. It offers a fantastic selection of great templates. You’ll have so many options, you’ll wish you needed more than one logo! Plus, you can use the templates to craft a unique image or inscription. The categories are marked with symbols so that you can find the right one in seconds and customize the tools panel for your needs. Apply multiple visual effects to embellish your logo and make it look eye-pleasing and refined. Perhaps the only drawback of this app is that it features annoying ads. For regular use, it’s wise to pay for an extended ad-free account. Updated — March 17, 2018. This app boasts a large database of templates and versatile tools. Its numerous advantages make it irreplaceable to everyone working on their corporate logo. Plus, we liked the idea of handy stickers! Update – March 15, 2018. What attracted us most here is the simple, eye-pleasing interface. You don’t have to look for a particular button or feature; everything you need is at your fingertips! Professional tools and a wide spectrum of colors will enable you to craft a beautiful design. Furthermore, you’ll have access to 2,000 icons sorted by category and more than 100 one-of-a-kind fonts to make your artwork stand out. Update – February 12, 2018. This app offers about 1,000 beautifully designed icons and 30 textures to create a mind-blowing composition! In addition, your design may be rotated in 3D to check how it’ll look in real life. With this abundance of editing options, you have no other choice but to make a mesmerizing emblem that’ll take your business to a new level. Update – December 20, 2017. 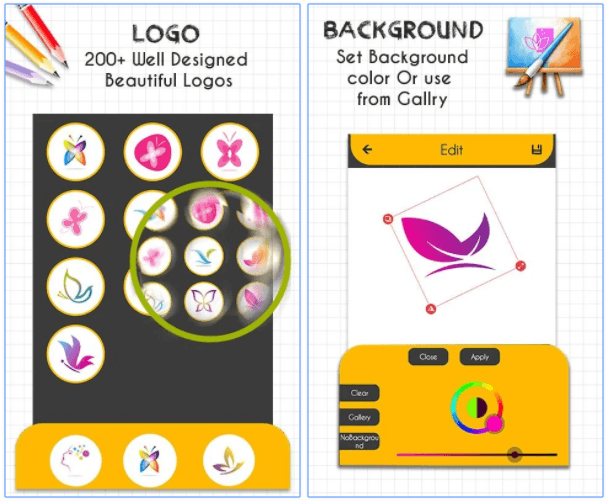 The tools panel that Designer Logo Maker offers will impress even experienced designers, let alone a perplexed beginner! Thousands of users choose this app for its sleek effects and clever filters to create stunning visuals for their business projects. Unfortunately, the app displays pop-up ads, so prepare to deal with this nuisance. Update – March 11, 2017. 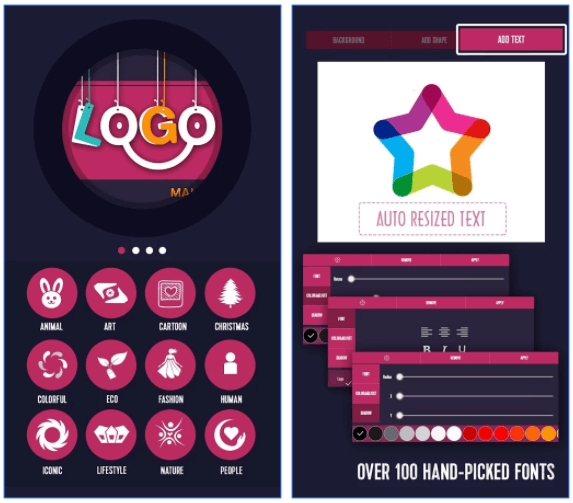 Developed by Universal Apps Center, this logo maker app can help you craft an emblem of any complexity, from minimalist designs to intricate artwork with several meanings. This high-end software offers more than 150 stylish icons that will provide a solid base for your future emblem. Plus, the app encourages you to unlock your creative power, allowing you to customize the color and size of default solutions in just a few seconds. Once you’re happy with the artwork on your screen, you can add it to the social media platforms, such as Facebook, WhatsApp, Instagram, etc. Update — August 8, 2017. Incredible colors and beautiful typefaces are among the many reasons why you should try this editing software. Extensive editing options allow you to easily change the size of your logo, rotate the icon, play around with fonts, and much more. Once you’re happy with your artwork, you have a possibility to save your emblem on a transparent background in PNG format. Update — September 25, 2017. Ranked highly by multiple users, these apps will suit both consummate designers and amateurs. You won’t regret trusting one of these programs with your corporate identity! If you don’t want to search and install apps, you have other ways to go. You can easily design a neat emblem using an online logo generator … and we know which one you should try first! Visit the Logaster website to check out all the opportunities this amazing logo maker offers to design amateurs like you. With a stunning set of fonts, icons, and color palettes, you can create a balanced design in raster (PNG, JPG) and vector (PDF, SVG) formats. Don’t wait. Check out Logaster right now. This is where you can get a custom-made emblem in a matter of minute.